MELISSA DUPREY is an actor, stand-up comic, activist, playwright, and musician from Humboldt Park, Chicago. She has 3 critically acclaimed solo shows with two more in development. 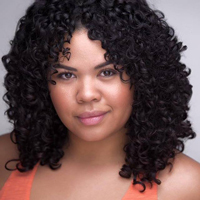 Her play Brujuja is an official selection of 16th Street’s 2019 Pop Up Reading Series. She was a new talent for the 2014 ABC Diversity Showcase in NYC. She is featured in the Emmy-nominated web series, “Brown Girls,” in development with HBO. She has multiple credits in TV and Film. She has been seen at The Goodman, Steppenwolf, Victory Gardens, Free Street Theater, and is honored to be making her Court Theatre debut. She is an Ensemble Member at UrbanTheater Company, and the Director of Production and Community Relations at Free Street Theater.